As part of the coursework I’m taking for an Assistive Technology Certificate at Bowling Green, I’m taking a class about Assistive Tech Implementation. The homework for the first week of our last class was really profound for me so I thought I’d share the resource here for you. This week our instructor asked us to rate our building/district on the Quality Indicators for Assistive Technology Services rating scale. 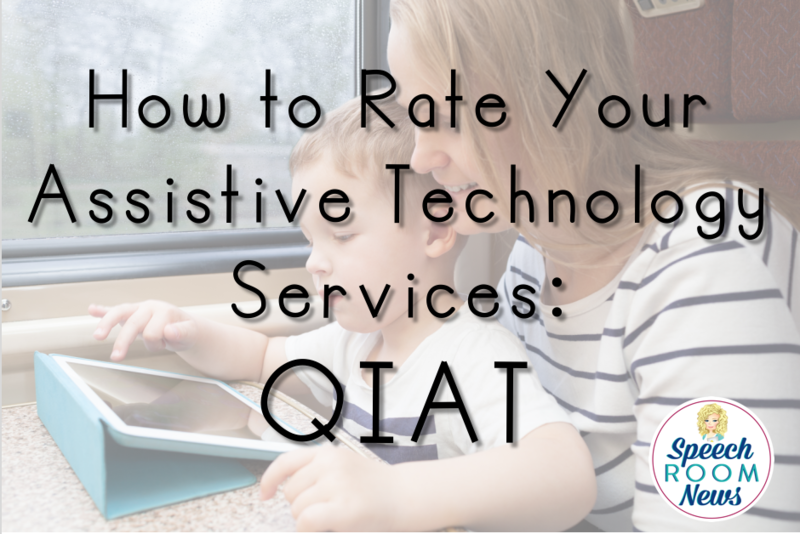 To rate your program, start by downloading the Quality Indicators in Assistive Technology Matrices Summary Worksheets from QIAT.org. You can spend some time browsing the different areas, goals, and things to avoid while reading about the quality indicators here. Using the QIAT is a great way for school teams to determine which quality indicators are an are of strength and which are an area of weakness. You could sit down with your team and complete the form together or have several team members fill them out and then compare. Develop a list of goals that would be attainable in the next year and begin to make those changes. I really like this simple AT Planner form available from the National Assistive Technology Research Institute (NATRI). Remember that Assistive Technology services are part of FAPE. The purpose of the IDEA (Individuals with Disabilities Education Act) is “To ensure that all children with disabilities have available to them a free appropriate public education that emphasizes special education and related services designed to meet their unique needs and prepare them for further education, employment, and independent living.” Assistive technology impacts education, employment and independent living, so it is the school team’s responsibility to develop an AT plan. Have you used the QIAT? I’d love to hear about your experience! Leave me a note in the comments or email me SpeechRoomNews@gmail.com. Carl, D. F. & Bowser, G. (2013). Assistive technology implementation: Online training module. In Ohio Center for Autism and Low Incidence (OCALI), Assistive Technology Internet Modules, www.atinternetmodules.org. Columbus, OH: OCALI. The QIAT Community (Revised, 2012). For additional information visit the QIAT website at http://www.qiat.org. Email joy@joyzabala.com for information on QIAT research. Hi Becki! I’m so glad you found it helpful! Thank you! This is very helpful. I often feel that teachers, administrators etc. feel that AT implementation is solely up to the SLP. It can be so overwhelming, especially in a setting such as my school where the bulk of the population is non-verbal students with autism.